As I mentioned in an earlier blog post, one component of the Meyer Schapiro Collection includes a comprehensive series of exhibition announcements he collected spanning from the 1920 through the 1990s. Being ephemeral in nature, exhibition announcements tend to be dispersed across collections or discarded. When they are in fact retained, they are treated as miscellaneous records that are not sufficiently described and therefore not always accessed. But there are several reasons why exhibition announcements are used for research, specifically when one is tracking the provenance of a specific work of art. 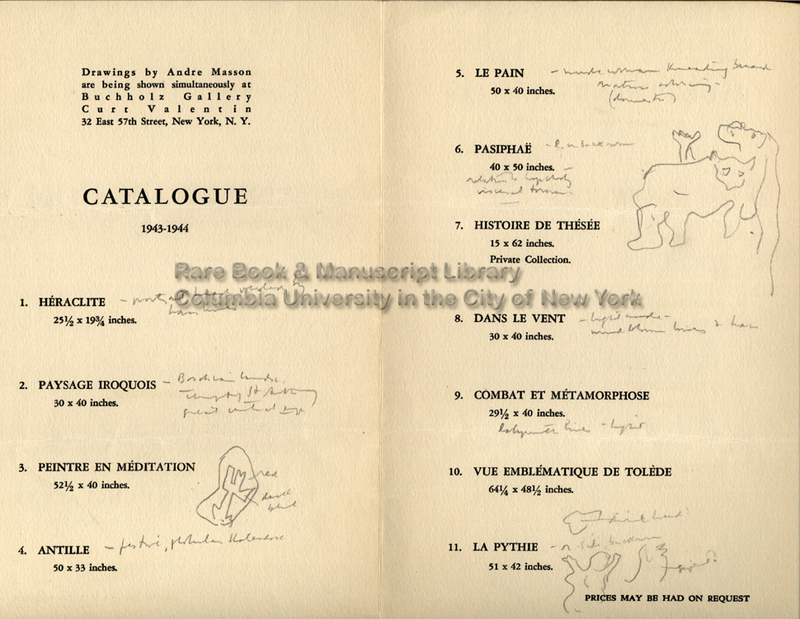 Because the Meyer Schapiro Collection houses a focused collection of New York City exhibition announcements and are organized by the artist’s last name and then chronologically, these records may become a vital source for provenance researchers seeking the custodial or ownership chain of a work of art. Provenance research for works of art held in museums are crucial for tracing the legality of their ownership, especially since local, national, and international laws require proof of legal custody. Works of art looted during the Nazi era and illegally excavated works of art purchased by institutions are two examples of how dubious provenance can ultimately effect the present day custody of a work of art. The Museum of Modern Art in New York houses a Provenance Research Project which focuses on Nazi Era looted works of art, as is appropriate for their collecting scope of modern art. The Project for the Study of Collecting and Provenance (PSCP) at the Getty Research Institute focus their expertise on providing a historical framework to understand the provenance of works of art by providing primary source material for researchers, such as the Provenance Index Database. Primary sources found at the PSCP also include auction house catalogs and estate inventories. Information can go as far back as the 16th century to allow further research into the chain of custody for works owned or created during those times. Provenance research is not only important legally, it also gives a glimpse on where art works have been exhibited, who sold them to whom, and why certain art works are where they are today. All these questions can potentially be answered by using primary sources, such as exhibition announcements, to track the custody, ownership, and exhibition history of a work of art. For kicks, I decided to do a very informal run on provenance research using Meyer Schapiro’s exhibition announcements. My only disclaimer is that this is not a comprehensive research assignment, but a quick tour on the internet that illustrates how primary sources can serve each other vis-à-vis provenance research. 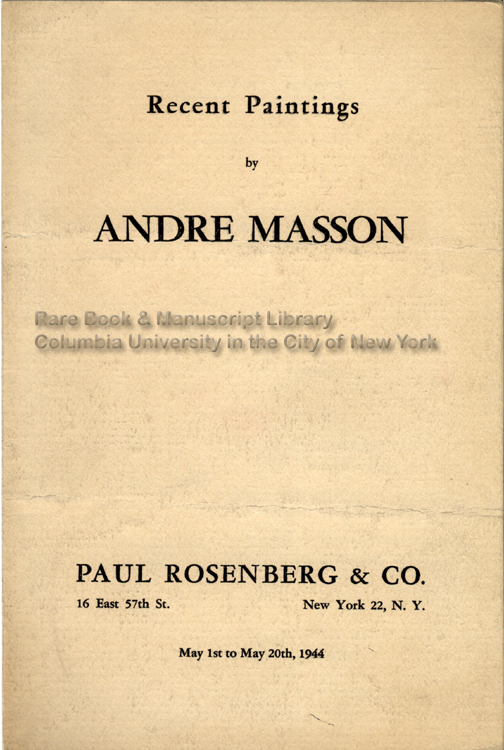 I decided to narrow in on one particular exhibition announcement that also served as an exhibition checklist for the then recent paintings of André Masson at the Paul Rosenberg & Co. gallery from May 1 through May 20, 1944 in New York City. I chose this particular exhibition announcement in particular because Schapiro himself annotated and drew in it, giving me further visual clues of what the art work can look like. This was the case with the art work listed as number six, Masson’s Pasiphaë that is given the dimension of 40 by 50 inches. Another search result was found on Artnet‘s website that documents the results of auction sales. In particular, a Masson Pasiphaë came up as being sold at a Sotheby’s New York auction on Tuesday, May 6, 2003 in their Impressionist & Modern Art sale, part one as lot number 38. Going to Sotheby’s website and searching under their "explore auctions" feature, I located this work and its attendant provenance as researched by Sotheby’s. 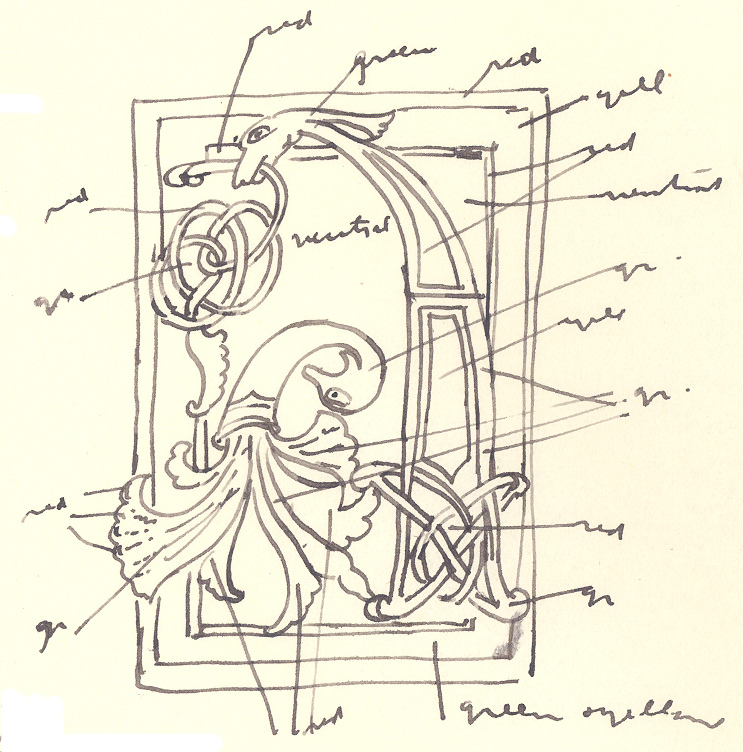 The image is very similar to Schapiro’s sketch in the exhibition announcement. Interestingly, the exhibition history as listed on Sotheby’s website does not include the exhibition held at Paul Rosenberg & Co. in 1944. Neither is it confirmed that Paul Rosenberg & Co. ever formally held it in their custody. For its provenance, Sotheby’s claims that Galerie Simon of Paris acquired the work directly from Masson and that, subsequently thereafter, Galerie Louise Leiris of Paris acquired it from Galerie Simon and held it until at least 1958. The Paul Rosenberg & Co. exhibit is never mentioned. After the 1950s, Sotheby’s lists that a William Rubin of New York possibly acquired the work and that subsequently the painting was in the custody of the Richard Feigen Gallery, Inc. in Chicago. 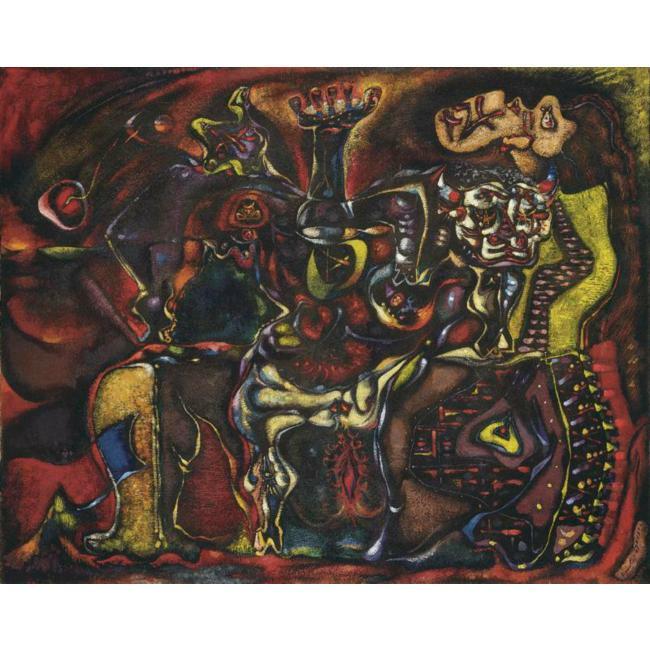 It was acquired by Dr. and Mrs. Jerome H. Hirschmann from the Feigan Gallery in 1960 and they were the ones bringing it to sale at Sotheby’s 2003 auction. So is the painting auctioned at Sotheby’s in 2003 the one mentioned in the Paul Rosenberg & Co. exhibition announcement ? It potentially could be, given that the painting was exhibited at the Whitney Museum in 1945, possibly directly after the Rosenberg & Co. exhibition. Of course, a more detailed, serious, and in-depth research assignment would be required to ascertain if the painting from Rosenberg & Co. is the one auctioned at Sotheby’s in 2003 (there is, after all, a discrepancy in dimensions by a 1/4 inch between what is listed in the exhibition announcement and Sotheby’s listing), but a quick gloss such as this gives a sense of how complex provenance research really is and the surprises that it yields. What, dear reader, would be your hypothesis on this? Your comments are most welcome. This entry was posted in Primary sources, Provenance research on October 29, 2009 by Administrator.